Mastering appropriate writing skills marks a critical learning period for high school students. With a creative approach, teaching students how to write persuasive, creative, research and descriptive writing can be a breeze. For college-bound students, writing a succinct and well-thought-out essay is crucial to success. Not only do students have to write an essay for the SAT, but most colleges will expect a student to be able to churn out a five to seven paragraph essay regularly for tests and class assignments. Persuasive essays focus on a specific argument and use evidence to back up your point of view. Students may need some help establishing a solid argument in the beginning, but will progress with practice. Should schools enforce student uniforms? Is it okay to give important messages via texting? Should high school be five years instead of four? Should schools move to a year-round schedule? Step 2. Your students then come up with a yes or no answer and a statement to support their response. For example, your student could write: "Yes, schools should have a uniform policy because it would help the student body avoid cliques." Step 3. Once students have a statement, have them write down five to eight supporting statements. Using the example above, the student would write five to eight ways in which school uniforms would equalize the student body. Step 4. At this point, students have an entire outline for a five-paragraph essay. Have them fill in details. Once they have an essay written, you can start working on the nitty-gritty details of word choice, editing out extraneous information and making sure the introduction and conclusion are solid. Question a day - Pose a question to students each day and give them around 15 minutes to answer. At the end of the week, have them choose one answer and develop it into a full essay. The class essay - As a class, write an essay on a given topic. Following the steps detailed above, choose a topic and beginning statement. Then lead students in a brainstorming activity to help them come up with the supporting ideas for the statement. Post-it note essays - Give students the essay topic and a stack of post-it notes. Have them write each idea on a separate post-it note in a predetermined amount of time. When they are done, ask them to organize their post-it notes in a logical sequence, getting rid of any notes that don't quite fit in. Run for president - Have each student create one platform, which is an idea on which they would run for president. Assign them to write a persuasive essay supporting their own candidacy, based on the select platform. Turn the essays into fun campaign speeches, and let students vote afterward for the most persuasive campaign. Persuade me to try it - Have students write an essay on their favorite activity or food. Ideally, it should be something not everyone in the class is into or has tried. When the essays are due, instead of collecting them, have each student read his or her essay aloud. Have students sign their name to anything they are persuaded to try. By high school, you really shouldn't have to teach the basic concept of creative writing, but instead should be able to focus on helping hone students' skills for things like word choice, organization, and other advanced writing concepts. To help engage your students' creative writing skills, try some different inspirational techniques to see which ones work best. You may find a combination of a few really help your students get into the creative writing spirit. Journaling - The best way to become a better writer is to practice writing. Encourage students to keep a journal. Offer journal prompts so students who claim to have nothing to write about have a topic, but don't require them. After students have about ten journal entries, ask them to choose one for you to read. Don't read the others. Use the sandwich critique - Never give students too much criticism on a piece of writing. Instead, when you comment make a 'critique sandwich.' Start with one thing that about the piece that you liked, one thing that needs improvement, and one thing that they should repeat in other writing. In this way, you give your students the freedom to explore new ideas and strategies without the fear of failure. This strategy will help them know what to work on, while also identifying skills to put in their arsenal of tried and true tactics. Publish - Whether it's the school newspaper, a classroom newsletter, or a blog, require students to finish a piece for publication once per month. Encourage reading - Good writers read a lot. Nothing inspires a writer more than reading well-written literature. Read poetry to them, have a book club in which you recommend a book that you love, or just pick a story and have them read it. Write with your students - If you have class time set aside to write, write with your students. Share with them your well-written pieces that you're proud of, and share with them your gaffes. This helps them know that creative writing is a process, not just a one shot to a successful story. Feature great writing - Consistently look for things in every student's writing to brag about to the rest of the class. Providing praise in this way will give your students confidence in their writing. However, keep in mind that you should never share a student's work with the class unless you have the author's permission. Students will respond to different types of writing exercises. Utilize a variety of options to appeal to different learning styles. Fix the ending - Take a popular movie, and have students re-write the ending. You can help inspire them by asking a 'what if' question like 'what if this character had been kind instead of mean,' or something similar. Story boards - Help students learn to organize a story well by creating story boards. If time permits, make the story boards into a short movie or script. Dramatic interpretation - Have students create a monologue that will be performed by another student. Personification exercise - Take the students outside and ask them to write down the first moving thing that they see. It could be a leaf, a squirrel or a car - but not a person. Then have them write a paragraph from that object's point of view. Just the intro - Spend some time reading the introductions of award-winning books. Ask students to list things they like about the introductions and how the introductions set the stage for the books. Then challenge them to write an 'award-winning' introduction to a story. To finish the project, exchange introductions, and have another student finish someone else's story. Read the finished products to the class. The classic research paper isn't a new assignment for high schoolers, but it can present some unique struggles. By focusing on specific problem areas, you can have students writing ace papers in no time. Students will often face similar issues when going up against the research paper. Try to help your students engage in the assignment by breaking it down into smaller steps. Choosing a topic - Have students start by choosing several different topics and then doing some brief research on them. For each topic, have them note how many and what type of resources are available. Often, it becomes apparent that their great idea doesn't have enough resources to support a full paper. Narrowing the topic - Start with a general topic like rain forests. Have students add one more major word to the topic (like rain forests in Brazil). Keep adding additional words, one at a time, until a clear topic emerges. Prepositions and abbreviations do not count as major words. Organizing - Have students write their first draft along with a brief outline that lists their major supporting points in short phrases. Next, have them assign each supporting point a different color. Using colored pencils, have them go through the paper and color or underline each sentence in the color that matches its assigned supporting argument. In this way, it quickly becomes apparent how well the paper is organized, and what may need to be done to fix it. To help your students succeed, be clear about what you expect from their papers and try to engage their creativity. Use this opportunity to inspire curiosity about their specific topic. Identify learning opportunities - As part of students' journal writing, ask them to make a list of things they want to know. Encourage creativity, and tell them the sky is the limit. Provide a rubric - Research writing is much easier for students if they know what's expected. Encourage students to write a draft, and then check off whether or not it meets all the points on your rubric. Make it fun - Wrap a research projects into other assignments. Assign students to make a public service announcement touting their research. Assign them to create a display board or brochure that shows various parts of their research. Community research blog - Consider choosing a topic the entire class could research and posting their findings on a blog. Each post can be one supporting argument for the topic at hand. Descriptive writing includes things like summaries as well as descriptions. While most descriptive writing in high school is going to be part of a larger project, it is an important skill for students to master. There are tons of great ways to help students work on their descriptive writing abilities. Start by picking assignments that they can easily relate to and then move on to more challenging material. Media reviews - Have students practice their descriptive writing skills by assigning summaries of popular movies, books, music or video games. Let them choose their favorites, and encourage them to use great language. Build a better paragraph - Choose something for students to look at - whether it's a piece of art or scenery outside. Have them write five descriptive sentences. Then make a list of commonly overused words that they must ban (such as very, really, good, bad). Have them rewrite their sentences accordingly by replacing banned words. If they didn't use any banned words, have them add adjectives and adverbs to the sentences to make them more interesting. Synonym scattergories - If adult writers struggle with word choice, high schoolers will too! Choose something to describe and as a class, brainstorm adjectives that describe the item. Come up with at least ten descriptive words. Have students exchange papers with someone, and ask them to come up with better, more descriptive synonyms for the words listed. You can go through several rounds. Award points for words that aren't repeated. Draw my writing - Have students write a description of a character, monster or item. Collect all the writing when students are done, and read them out loud. Have students draw (to the best of their ability) the description. Lead a discussion on whether or not the drawings match the writer's envisioned character. Then, as a class, brainstorm words that might be more descriptive. Setting prompts - Choose five or six well-known stories and give students a sentence where they have to describe the setting. Then, using their descriptions of the settings from the stories you chose, compare details. Use this to springboard a discussion on the importance of description in a story. Keep students writing by offering a variety of assignments on interesting topics, and a mix of pre-assigned topics and student-created topics. Teach them that written expression is important both by writing alongside them and offering opportunities to publish the work they want to share. 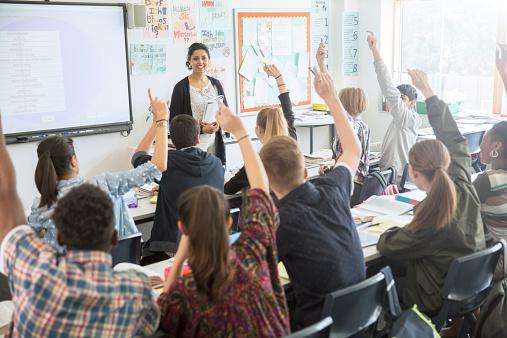 If you're consistent in requiring writing from your students and offering feedback to help them improve, they will soon learn to embrace writing as a tool for effective communication.